Figure A49. Komsomolets anomaly, interpreted as the Komsomolets slab, with (horizontal) [vertical] cross sections through (A)[D] the UUP07 p-wave) and (B)[D] the combined SL2013 and S40RTS s-wave models at 2010 km; C) the location of the modern geological record that we interpret to have formed during the subduction of the slab. 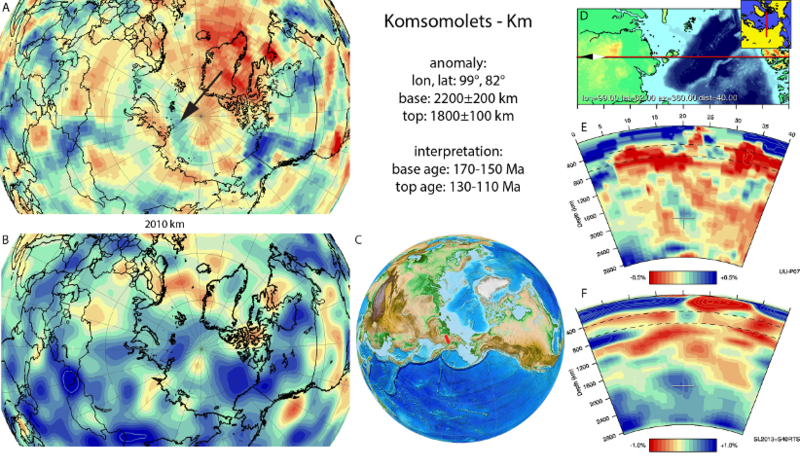 The Komsomolets anomaly (Figure A49) is located below northernmost Asia within the deep mantle and was not previously defined. It is E-W trending and its shallowest and easternmost location it may connect to the Chukchi slab (section 3.28). Based on the Chukchi slab as well as the Mongol-Kazakh slab to the south, we interpret the anomaly as a Lower Mesozoic slab subducted in the paleo-Arctic region. In the Arctic, a record of mid-Mesozoic subduction, along a continental margin, is preserved in the form of the Svyatoy-Nos arc located in northernmost Siberia (Nokleberg et al., 2000). According to Nokleberg et al. (2000) and Sokolov (2010) this arc was active in the Late Jurassic to Early Cretaceous and was part of a south dipping subduction zone, subducting South Anyui oceanic lithosphere. We date the subduction of the Komsomolets slab by this arc. In the reconstruction of Shephard et al. (2013) the Svyatoy-Nos arc is not modelled as such but would be located as the time-equivalent continuation of the Oloy subduction zone in between Siberia and Baltica.